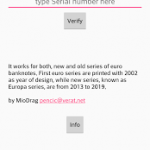 It works for both, new and old series of euro banknotes. First euro series are printed with 2002 as year of design, while new series, known as Europa series, are from 2013 to 2019. 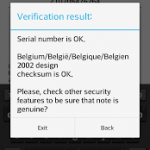 All you have to do is to enter serial number, from back side of note, and press button . 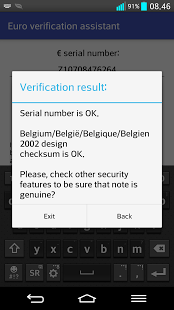 Result is shown in 4 parts: 1st = serial number status, 2nd = printed in, 3rd = design year, 4th = checksum status. 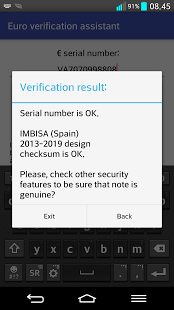 If any part of result is wrong, then the note is not genuine, but if they are all OK, you should check other key security features to be sure that note is genuine. It is known that even the cash machines can not uncover high-quality forgeries, but such forgeries do not always have the correct serial number, and in this case this application can detect such counterfeits. 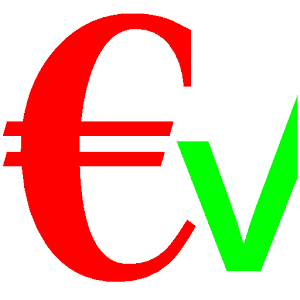 Simple counterfeit such as photocopies are easily discovered because they have not all the necessary security elements – and this is reason why application suggest that you should check other security elements – application checks up only only serial number checksum, and it is sufficient to detect even high-quality counterfeits that pass check cash machines, if serial is wrong.